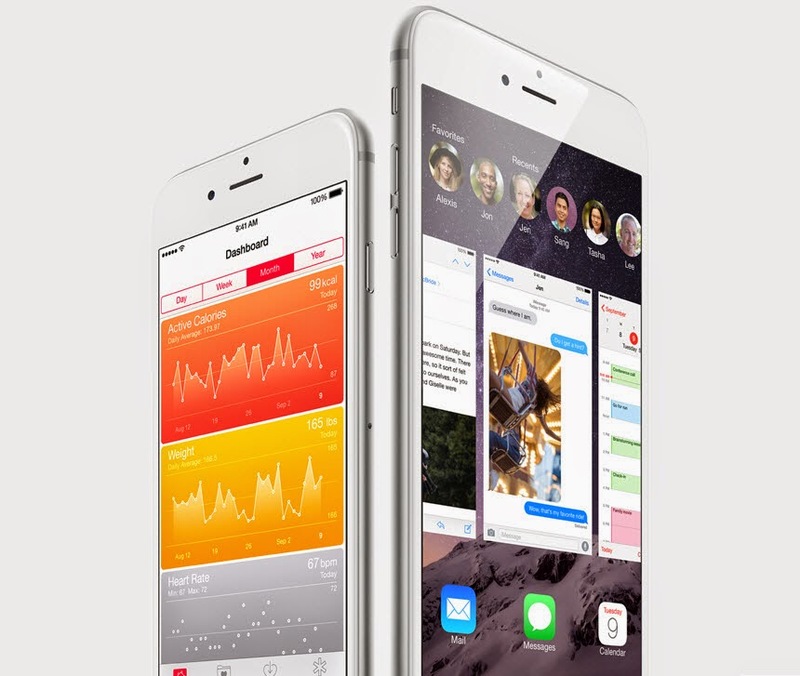 Apple held its keynote and has unveiled its new smartphone iPhone 6 in two versions, 4.7 and 5.5-inch. The Apple press conference was eagerly awaited to see their new smartphone. As reported the rumors, it's not one but two versions of the iPhone 6 that were presented. This new generation does not mark a break with its predecessors. Apple has followed the trend by developing the largest smartphones, but says "the iPhone 6 is not just bigger - it's better in every way." These new models take advantage, in fact, different improvements. The level of the screen, the models are 4.7 and 5.5 inches, come with a new Retina HD technology. The iPhone 6 displays a resolution of 1334 x 750 pixels (326 dpi) and 1920 x 1080 pixels (421 dpi) for the iPhone 6 Plus. Compared to the previous model, the iPhone 6 has 38% more pixels, and 185% for the iPhone 6 Plus. Inside, the iPhone 6 has a 64-bit architecture A8 processor with 2 billion transistors and 20 nm engraving. According to Apple, the CPU is 20% faster than the previous iPhone, and GPU 50%. Also, a coprocessor M8 is built to make the most of different sensors, including the new and barometer sensors for monitoring health. Regarding the photo, the rear camera sensor is always 8 megapixels, but has been improved among others, with a Focus Pixels, a flash "True Tone" and an optical stabilizer for the iPhone 6 Plus. In front, a FaceTime HD camera with 1.2 megapixel f / 2.2 is integrated. In addition, the model is 4G LTE-compatible (150 Mb / s) on 20 different frequencies. This allows for fast data transfer, but also to support the "Voice over LTE" (VoLTE) to make calls with high sound quality. With WiFi (802.11ac) up to three times faster, it will be possible to use it to make calls on the iPhone 6 The "Wi-Fi Calling" will be an alternative to not consume its crime or when the cellular network is inadequate. Furthermore, the fingerprint sensor, Touch ID, has been optimized for use with third party apps. According to Apple, the "fingerprint is the ideal password," and the still developing through this new generation of smartphones and iOS 8 Importantly, this technology secures the new "Apple Pay" feature, which allows you to pay contactless in physical stores. With NFC, Apple wants to extend this form of purchase that will, initially launched in the United States. Apple has improved the battery. Without specifying power, the group said that in 3G communication, autonomy goes up to 24 hours for the iPhone Plus and 14 hours for the iPhone 6, while the iPhone 5S was up to 10 hours . In terms of design, the new iPhone keeping the same aesthetics, but have rounded edges and a power button positioned on the side now. Larger, both models are heavier than the iPhone 5S (112 grams), but are thinner than it (58.6 mm). Thus, the iPhone 6 Plus is 158.1 x 77.8 dimensions x 7.1 mm and weighs 172 grams and the iPhone 6 of 138.1 x 67 x 6.9 mm and weighs 129 grams. Both iPhone 6 will be available with 16, 64 or 128 GB in colors gold, silver and black. The 16GB version will cost £ 539, 64GB will be £ 619, and up to £ 699 for the 128GB version.